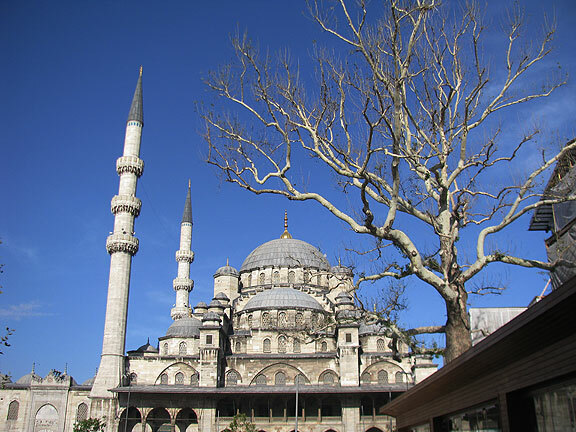 I attended a unique event in Istanbul, Turkey from October 11-14, 2013, called “Giftival,” a neologism combining gift and festival. 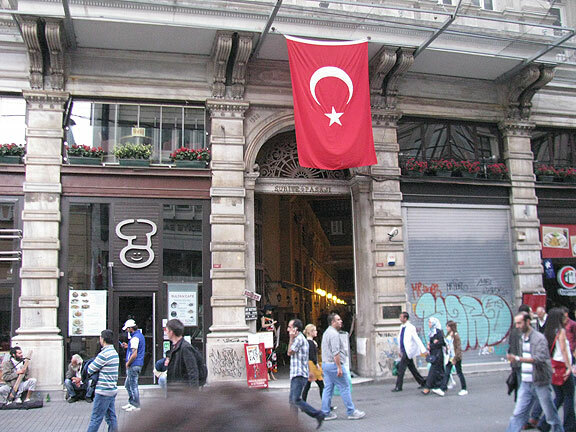 The front door of our building for Gifival, on Istiklal in Istanbul, Turkey. 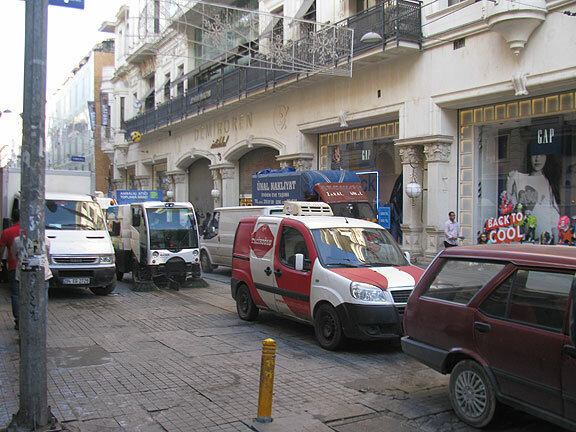 The choking morning on the same street… the only time vehicles are on there. 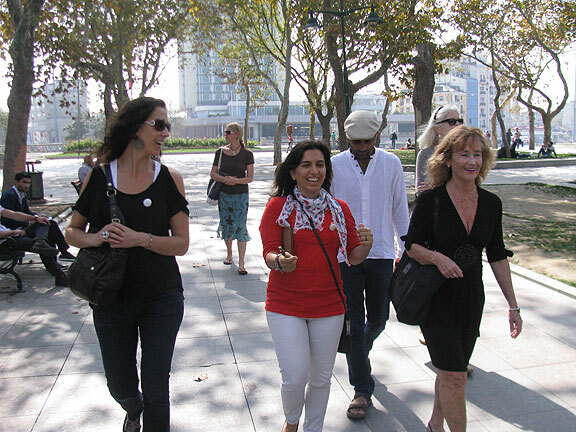 The event brought together people who are focusing on gift economy and gift culture as part of their core work in the world, arriving from an abundance and security perspective. 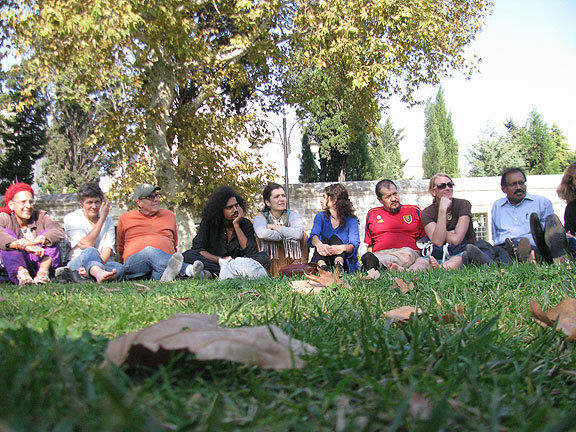 Attendees came from far and wide: seven or eight from India, a half dozen from the U.S., various individuals from Nigeria, Brazil, Iran, Palestine, Jordan, Mexico, England, Canada, Czech Republic, Holland, France, a Swiss-German family living on a commune in Portugal, an Australian living at Findhorn in Scotland, and another 8-10 from various parts of Turkey. Pretty evenly divided between men and women, and we spanned the ages with two children ages 1 and 2 to a few older than 65. It was a very interesting bunch! Folks from a local timebank called Zumbara were instrumental in calling for and hosting Giftival, and their hospitality and generosity will be remembered by all of us. We were housed in nearby hostels and hotels, and fed delicious homemade meals for lunch and dinner every day.There were about 35 attendees at any given moment, though we had an open session on the Sunday afternoon when another 40-50 locals came in and joined us in a series of breakouts and then group discussion, followed by a potluck dinner. Our meeting place was in an old 19th century building on the main pedestrian boulevard called Istiklal, so we were four floors above the constant hum of thousands of passing pedestrians and a funny repetitive accordion riff that appeared regularly during the afternoons, providing an extra soundtrack for our thoughts and discussions. Going there in the mornings we had to weave between dozens of delivery and garbage trucks, the air choking with their exhaust, but by the time we’d leave during the afternoon or in the evening, the street was back to being a throbbing public promenade. Side streets and alleys too are full of people on foot, and all the restaurants and bars are crowded with people of all types, making this part of Istanbul a super magnetic urban space. 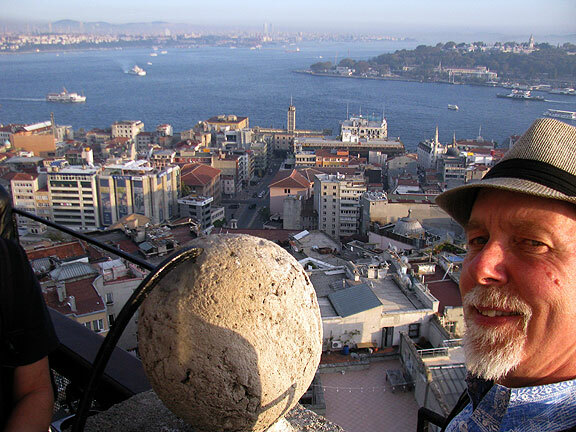 After we closed down on Monday evening, we were treated to a boat ride from the Golden Horn out into the Bosphorus, northward towards the Black Sea, and then back to the Istanbul shore, coursing the dark waters between Europe and Asia under starlit skies on a cool but pleasant evening. For us visitors, the environment was enchanting. We were in the top floor of this building. 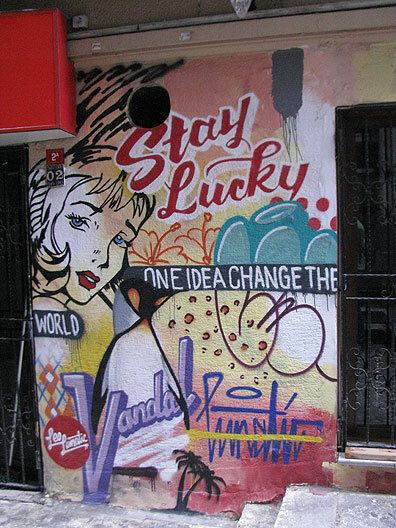 For the locals who called us together, the intensity of the recent events around Gezi Park was still quite fresh, and their compelling descriptions during our first morning together quickly penetrated any jet lag or uncertain distance we may have held. 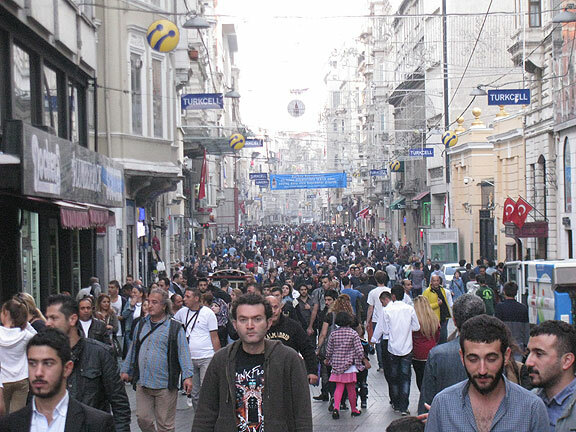 To hear about tens of thousands bringing food in a 15-minute period to a kilometers-long “table” spread down the middle of Istiklal (where major multinational brand stores and boutiques predominate) touched us all and produced a palpable excitement, even several months later. Combined with the other stories of amazing events, unexpected serendipities, spontaneous solidarities, and more, we could feel in the room the “eros effect” that had been so present during those summer days, and was still lending its long tailing residue to our gathering in a surprising but delightful way. 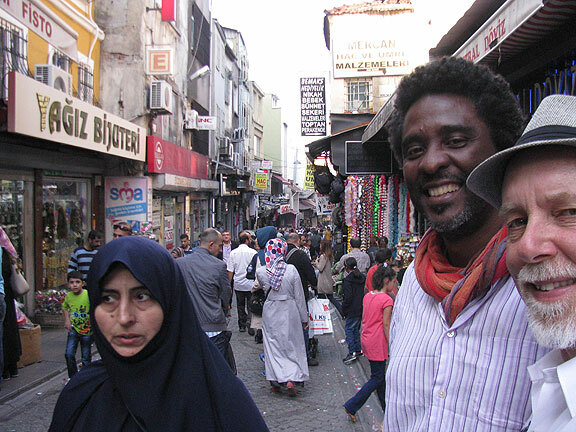 At one point during the protests the government told mothers to go and get their children from Gezi to save them from attack, and instead the mothers by the thousands converged on Gezi with food and confronted the police themselves…. some of our friends here said they never ate better than during those heady days. In fact, they even talked about falling in love with everyone in the streets. Here’s Judith pointing to a flow chart on the wall during our first day. Parallel to the supposed museum and cultural center slated for Gezi Park, I was told another story too, about all the wealthy shoppers coming to Istanbul from the United Arab Emirates. The government wants to build a new enclave for these elite shoppers on the Asian shore of the Bosphorus right where the historic rail station is. When the proposal was made public, citizens protested and managed to stop the plans. But not long after that, a mysterious fire started on the roof of the train station—when it was put out, the government declared the station unsafe and has closed it ever since. Trains now stop at blocky cement station one stop up the line, and many despair that the plans to demolish the old, elegant train station will now go forward again. It all appears to be more evidence of the deeply corrupt government that found itself unexpectedly facing hundreds of thousands of its own citizens in over a dozen cities this past summer, in protests that seemed to erupt from nowhere. Revolts are so unpredictable. 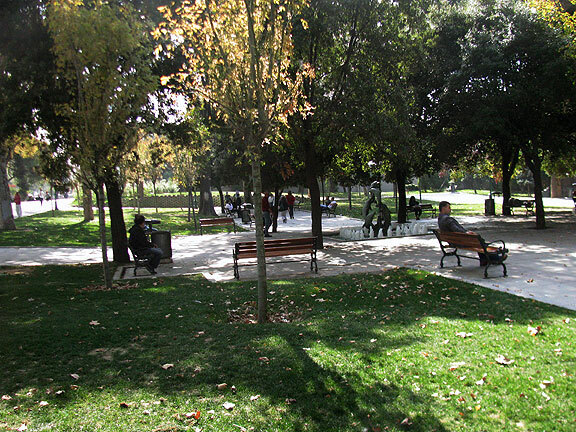 Gezi started with the simple idea of saving two trees from cutting, but quickly expanded to resistance to the insider dealing by the political elite, opposition to neoliberal capitalism, imposition of Islamic rules on Turkish society especially on behalf of women, and so on.The huge citizen revolt didn’t end in a bloodbath, though the government did use heavy police violence to drive protesters away from Gezi Park at the time. But those countless people had a taste of something very different and won’t forget the many things they learned during those intoxicating days. 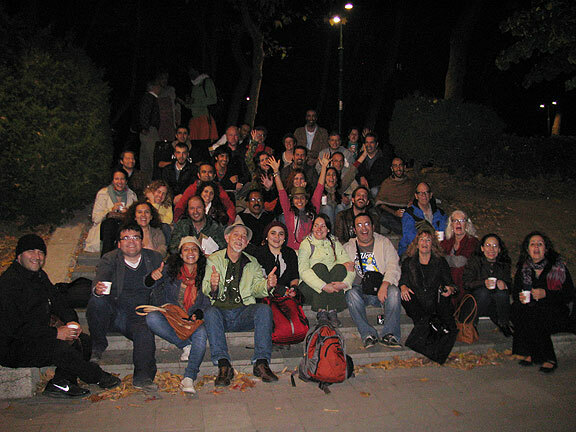 Giftival was an effort by some of those Turkish people to take a new step, to bring together an international and intentional community of thinkers and activists to help promote the Gift as a different paradigm for how we organize and reproduce our material life together. As it turns out, while the idea of the “gift” was invoked often during the four days we were together, the term was left undefined and thus was used for everything from being alive and taking a breath, to the food we received, the warm feelings many were experiencing for each other, simple acts of kindness we shared, to tentative efforts to address the capitalist system, and to try to point to a different logic than wage-labor and economic exchange as a basis for life. There were frankly a few too many “hallmark card” moments for my taste. I punningly named this account “Giftivalve” because after four days of meeting, mostly in one room in a big circle, and having shared a number of go-rounds with everyone, I felt like the idea of the Gift that motivated us to gather, while never clearly defined or demarcated, nevertheless acted as a valve into the hearts of most the folks who had come together. Once the valve was opened with the commencement of our mini-conference, an extraordinary torrent of emotions gushed forth, and really never stopped for the whole four days. Moreover, the torrent of emotions that seemed to have been triggered for many participants came to dominate the proceedings, frequently overwhelming people as they spoke. 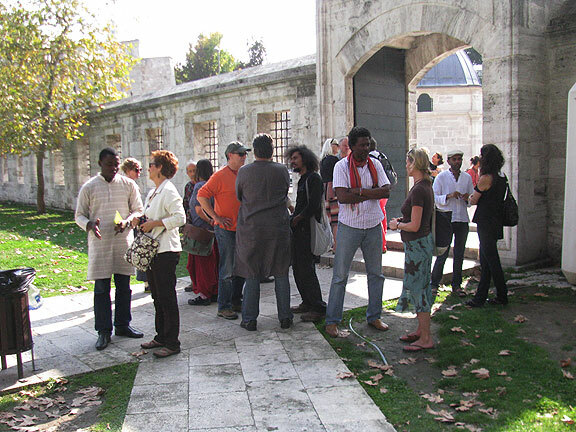 Robyn, Munir, and Judith, with others behind, at the gates to Suleiman Mosque gardens. 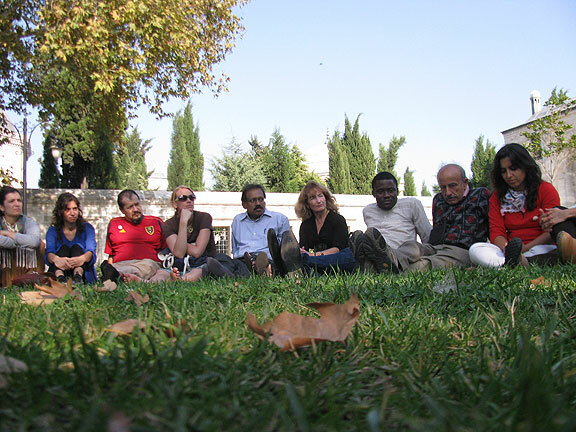 At the Suleiman Mosque garden…. Perhaps it is extremely rare for many of these new friends and comrades to be able to speak freely about their feelings, to connect those feelings to deeper political aspirations. I’m not sure. I can only say that it left me puzzled some of the time, frustrated other times, quite sympathetic and interested many times too, but ultimately dissatisfied that so much time was spent on discussions of the deeply subjective sensibilities invoked by the simple idea of the Gift. I could be wrong of course. Maybe the only way we could ever begin to shift society to a spirit of gift is to profoundly deepen our emotional connections. Clearly the idea of “gifting” is very loaded for many, and one reaction that a number of participants seemed to have was to be completely humbled by their own doubts about their deservingness of gifts (ability to receive), or doubts about their adequacy as gift givers. Or perhaps it was simply the deep yearning for a new way of life, so present among the gathered, that triggered such strong emotional reactions. Generally, most people at Giftival were content to keep the conversation focused on feeling states and “speaking from the heart,” which gave it a strongly therapeutic bent again and again. My gripe is that while connecting politics to feelings and personal stories is important, to let that derail more complicated and intellectual inquiry into the topic doesn’t help. Additionally, because we couldn’t really ever focus on a simple effort to define what the topic included or excluded, anything and everything was in the mix, and quite often we fell back on “new age” tautologies as though they were providing some profound insight, e.g. “everyone who is here is who is supposed to be here,” or “whatever happens is what was supposed to happen,” or other empty phrases like that. Some Giftival participants are deeply spiritual people too, and for them the idea of “gift” was inseparable from their relationship to their idea of god or the universe, and they repeatedly invoked a spiritual concept of giving, which included gratitude for life itself, for the nourishment from the earth, and so on. It was hard to get the focus to move towards the complicated questions of scaling up new ways of doing things to handle all the needs of complex urban society currently embedded in a global capitalist economy. The gift metaphor was so imprecise that the discussions most often went back to questions of trust, safety, and (oddly to me, since I am entirely areligious and even anti-religious) “oneness.” It makes it difficult to discuss a larger political-economic transformation, though, if it is repeatedly blocked by individuals “speaking from the heart,” invoking spiritual and metaphysical assumptions in place of political analysis. This predicament required some humility on my part (and I assume on the part of other folks), as we had to accept that this would not be a conference with the typical structures we’d known through academic or professional life (not that I like those either!). The way of knowing that characterized our gathering was apparently less mind-oriented and more heart-oriented, a dualism I always find unconvincing. I don’t mind sharing feelings with others—even complete strangers—but I don’t feel comfortable with imposed rituals, premature assumptions of collective affection, etc. So I had to adjust to this, as I’ve had to do many times in what I generally characterize as “new agey” gatherings in California where a similar (anti-)logic tends to prevail. (During a decade of attending a Thanksgiving gathering of about 100 people, I was always the curmudgeon who hated to hold hands or participate in circles.) Integrating three dozen people of widely varying cultural origins, emotional preferences, and intellectual or spiritual orientations into a shared conversation is not going to be easy no matter what. So we probably did pretty well all things considered. In fact, on the third morning I was chafing when I felt the conversation had yet again been hijacked into a narrow channel of personal emotions, and after I advocated for a different, more broad and critical inquiry into historical examples that would inform our idea of Gift—or preferably, a freely associated social production system—a lot of people were supportive, but some were hurt and felt attacked. A tense conversation carried on for another hour and a half. Nobody walked out, nobody got hysterical or unduly loud or angry. After lunch, Edgard from Brazil shared with us how impressed and moved he was that we had all hung in there and listened to each other with respect and compassion, and that he had never seen that before. That was about as close as we got to an actual debate, and because it was posing two ways of knowing that seemed to be fairly irreconcilable in the room, we had to let it go. I certainly did not want to impose my will and I don’t think anyone else did either, which may be precisely what made it possible to continue without resolution, but also without great animosity. 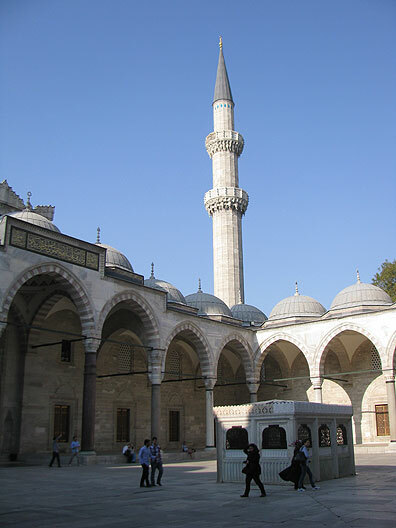 Interior courtyard at the Suleiman Mosque. 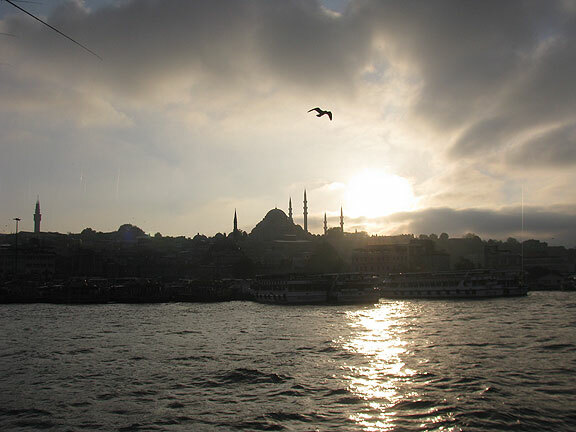 View across the Golden Horn at sunset, at Suleiman Mosque. Discussing the “gift” as a category was problematic, and thus mostly avoided. Charles Eisenstein intelligently brought up David Graeber’s sprawling but fascinating look at the history of debt (Debt: the First 5000 years). Graeber describes the earliest known gifts which functioned to consolidate inter-clan relationships. Typically early gifts were cows or other animals, but after a while patriarchs began to bestow their daughters on politically important people in arranged marriages as a way to firm up useful connections. Eventually, these kinds of behaviors led to the rise of chattel slavery wherein people become alienable property, and can be moved around as things, and thus could be “gifted” from one owner to another. However grim these origins may be, clearly gifts have rarely been without social purpose in history. You give a gift, perhaps not to get an equal exchange, but to establish and consolidate relationships. For many, even to the present, gifts imply a debt; this was briefly touched upon during our discussions too, as several people talked about trying to become better at receiving, something they admitted had been an ongoing struggle in their lives. So one of our missed opportunites at Giftival was to try to penetrate these differing meanings and layers of Gift, both in history and the present. Can gifts exist without expectations? Should they? 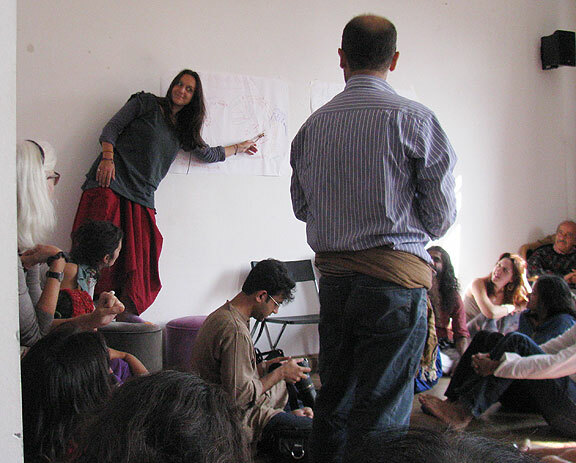 Are gifts meant to help establish a system of social accountability in lieu of separate and disconnected communities or individuals? If they do, how is it that they evolve over time into systems of formal debts, and even set the stage for the rise of money? If gifts have purpose, are they really gifts? Is there such a thing as gift without reciprocation, and if so, is that what we mean when we think of the gift as potential alternative model or metaphor for human social reproduction? Can gifts enhance a sense of personal freedom, or should they? How does the embeddedness of relationships reinforced by a culture of gift-giving unravel in the face of the unencumbered “freedom” provided by the anonymity and unembeddedness of cash transactions? The question was further muddied by the presence of a slippery slope into the contemporary enthusiasm about the “sharing economy,” and even social entrepreneurship. How is renting (selling) a room in your house sharing? And even more questionable, how is renting a room in your house, or a seat in your car even remotely connected to the idea of a gift? Members of the Zumbara timebank in Istanbul gifted us with delicious lunches and important material support throughout our stay, so clearly the web of human relationships embodied in that particular timebank is ready and willing to go beyond formal exchange and reliance on precise equivalencies to give their time and skills freely. Perhaps the individuals had a variety of reasons, both emotional and practical, for providing these lovely meals. We certainly felt a collective gratitude as we received them. We were also housed in a new “hub” opening soon on the fourth floor of the stately 19th century building, which will be a site for social entrepreneurs and the local sharing economy to work and cross-pollinate. 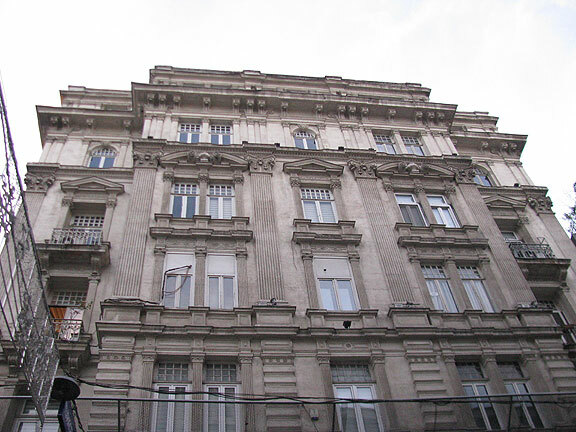 (I learned that most of these gorgeous old buildings had been taken from Armenians and Jews in the 1910s and ‘20s (during the mass expulsions and Armenian genocide that accompanied and followed the upheavals of WWI), and many had remained largely vacant for decades. Now they’re owned by a state agency called “The Foundation” and if you have the right connections you can get a space at a nominal rent in such places.) Apparently someone in the “Foundation” wants to help kickstart social entrepreneurism in Istanbul, and they “gifted” the space to us for our four-day gathering. But I remain completely skeptical about the connection between these business incubators and new social relations. Timebanks allow people to exchange their time and skills asynchronously and without money, but usually they depend on a basic hourly price as a way to calculate everyone’s participation. In my cynicism about these kinds of models, it’s hard not to see them as basically inefficient forms of money, that only obscure the underlying equivalencies being exchanged. 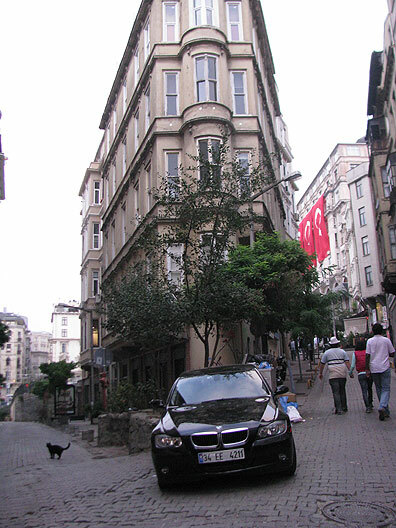 Istanbul is overwhelmed by cars; this one parked in an otherwise nice corner spot in a pedestrian zone. On Sunday afternoon, the third day, we had the planned mingling with the larger local community and that was a big success for the local hosts. About 50-70 people came in and we did the “open space” thing, which is a formal way of breaking out into groups, but you have individuals “listen for their call” and decide what topic to host at the last minute, after a couple of minutes of silence (they depend on a lot of the new agey forms here in this crowd—even though we’re from 14 countries, the culture is weirdly similar)… and then everyone votes with their feet and goes where they want as long or short as they like. That’s when I gave my first Nowtopia talk, pitched as “paid work vs. free (unpaid) work,” which lasted for the designated 25 minutes. 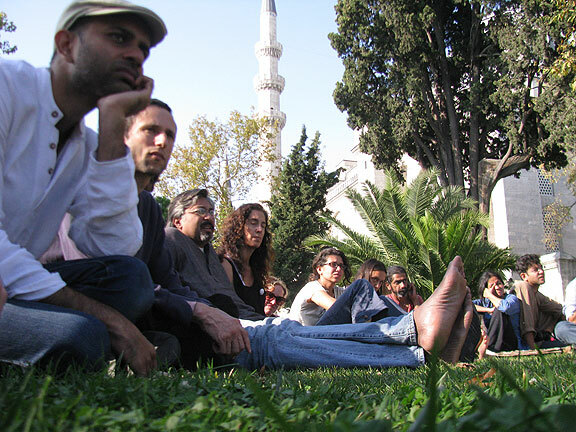 This went pretty well, with about 15 people sitting in, and afterwards there was a request to give a longer Nowtopia talk before I left Istanbul. 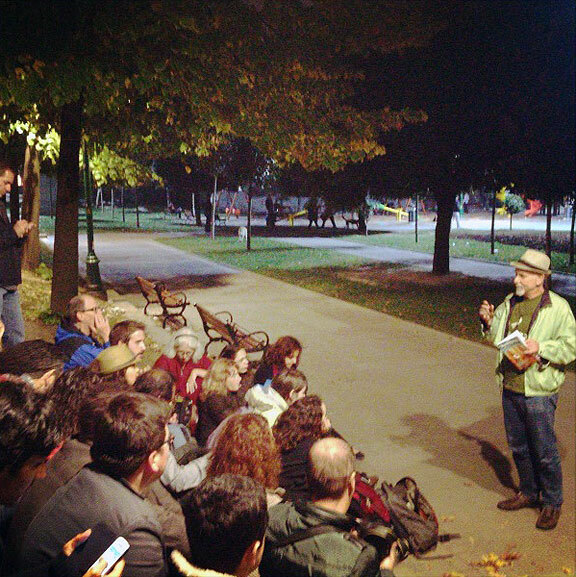 No time to waste, we decided to do it later that night, so at 9 p.m., about 40 of us walked over to Gezi Park at Istanbul’s central Taksim Square where everyone gathered on a short staircase and I gave a summary of the Nowtopia argument. 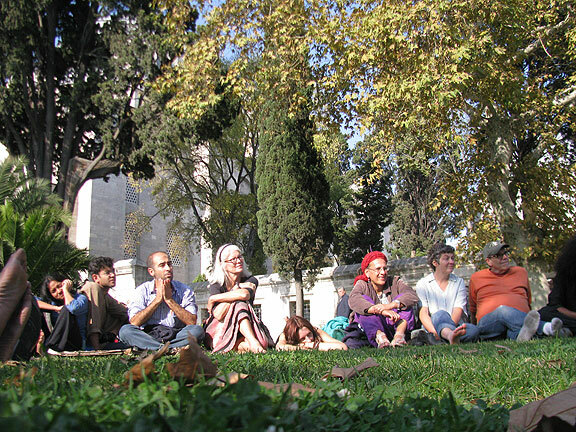 Afterwards, we were regaled with more stories from our hosts who took us to the key locations in Gezi Park where they had been immersed in the recent occupation and protests there. Regardless of the various confusions, missed signals, and shortcomings I am describing, many interesting points arose at different moments of the four days, too, so I’ll just recount a few of them as they occur to me. One of my favorite colleagues there was Munir Fasheh from Palestine (born in 1941, he was our eldest participant) who has lived through it all—British occupation, the war and expulsion that created Israel, the years of limbo, the 1972 war, the first and second Intifada, and so on. 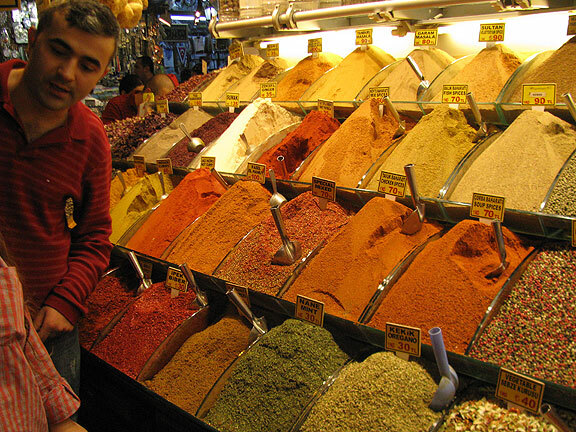 Munir’s most resonant contribution may have been his telling us how he found the Arabic language a source of ongoing gifts in his life, and unpacking various words and concepts in it kept illuminating other ways humans have lived in history outside of the pernicious logic of markets and money. He told us about “mujaawarah” (it’s an Arabic word in a whole other alphabet, but it was pronounced “moo-zhah-bra”) which doesn’t have a perfect analogue in English but is close to the idea of “neighboring.” When you turn ‘neighbor’ into a verb, it gets twice as interesting for all the implied possibilities of rich relationships. In fact, Munir was advocating it as a better alternative to formal education in terms of how people actually learn best. He made the fascinating point that life was better under a military occupation because that united them all—they were “ahaili” which he translated roughly as “people in community.” But since 1993 Palestinians were declared “citizens” under the pseudo-“national government” and since then things were much worse because everyone became very divided. He also told me later about how Ramallah had been wrecked in the past few years by the IMF/World Bank who had opened the occupied city to an influx of foreign banks. Now there are banks everywhere and most of the population is falling into ever increasing debts. He suggested that this is why Palestinians have been relatively quiescent during the recent uprisings in Egypt, Tunisia, Libya, and Syria. Lastly, Munir urged us to work on re-establishing a bridge between Cairo and Istanbul, once a very close relationship but that had been destroyed 100 years ago in WWI by the British and French when they defeated the Ottoman Empire. Another great colleague, the only person I knew previously, was Edgard Gouveia from Brazil. 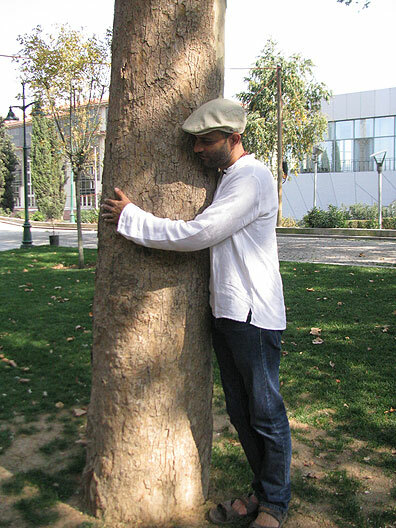 We’d met a couple of years ago at TedxAmazonia, where we shared that odd experience of participating in a conference on “Quality of Life for All Beings” on a “floating” luxury hotel mired in the mud of a drought-stricken Amazon. It was delightful to reconnect in Istanbul, and since two years ago, he has made great progress on his grand scheme to launch a movement to mobilize two billion people to save the planet. He has developed a game with science-fictional qualities but in beta testing has already reached thousands and shown it can stimulate the kind of engagement he and his co-creators are hoping for. He has a plan about how he’s going to launch it, so I won’t say more now, but I will say that his demo is very impressive and quite inspiring (check out the video I linked to his name above). It’s not hard to see his project doing what he says he wants it to, regardless of how grandiose it sounds. 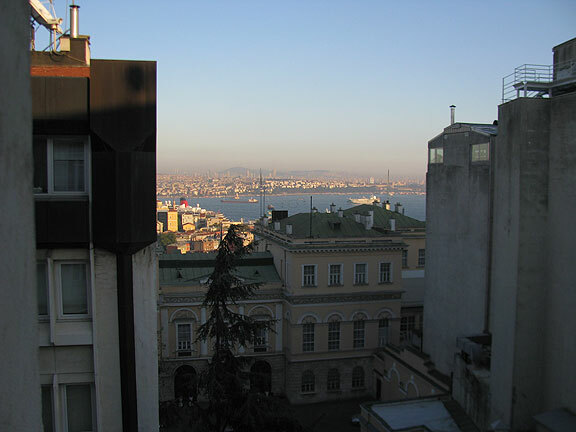 View from Galata Tower to the east across mouth of Golden Horn and Bosphorus. Later that same day we all went via taxi to the Suleiman the Magnificent Mosque, and after lunch toured around the grounds, sat in a courtyard where Aysegul, one of the main organizers, told a series of stories about her own family and the remarkable period of history (the 1300s) when Suleiman was in power. During that golden era, many intellectuals and artists and architects who were all contemporaries produced a dynamic, creative culture, including building the amazing mosque and palace, which also included a cemetery, a library (just being restored, full of handwritten pre-printing manuscripts), a preschool, and the nearby market which was known in those times as the “Addicts Market”—apparently you could buy opium there in the 1300s!. Then we walked back, which meant down through the Egyptian Spice Market, across the Golden Horn at sunset, sat and had a Turkish coffee on the way, and then climbed the hill past Galata Tower (built during Byzantium in 560 AD, later rebuilt and reinforced by the Venetians in the 1300s before being taken by the Turks in 1453) and returned to a big south Indian feast prepared by some of our Indian comrades. Many new friendships were formed at Giftival, and many previous relationships were renewed and strengthened. If it’s true, as we all believe, that we’re living through a profound historical shift in human society, whether or not the “Gift” is the prevailing metaphor for the evolution we’re living matters less than the dynamic connections we now all share across the planet. A small group, to be sure, but maybe our collective thinking and agitating will have inordinately large effects. We’ll just have to let things take their course and check back later. As always, insightful, fascinating reportage – obviously good folks, trying to live a creative life in the face of the supersystem – but I’m always on the side of the misgivings. Boy, are they voiced well here, yet I see no future with spiritual/oneness/New Agey folks. What patience is showed by so many anti-religionists, who are always on the defensive against the self-focus and self-reverie of the sacred wizard types. Where is the value of having some limits to protect privacy, instead of the mania for intrusive self-disclosure? Yes, there is that proverbial wonder and beauty to the universe,but also a rotten supersystem, stacked decks against the poor, jackass bosses, and ads for Coke. 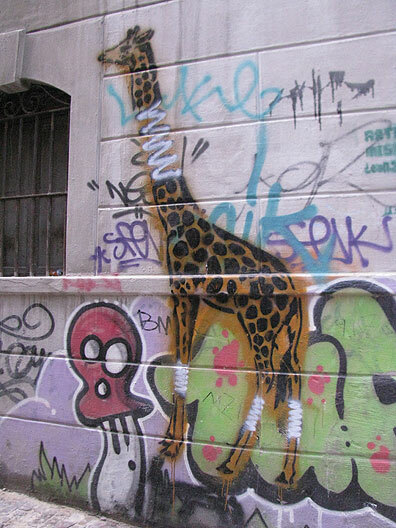 Who walls themself off from the totality of the human experience? Great read! thanks for sharing, yes, how to achieve the balance between emotion and intelligent analysis. When we can see the intelligence as serving the heart and not separate, we are at our best..
Also to be considered is a sense that we are here to “gift”, to share our unique talents and perspectives, as part of life and our gratitude for being here. Since we are conscious of all that we receive it is incumbent upon our very existence to give in return. Otherwise we carry this shadow of knowing we are always taking because there is no way we could ever do enough to earn what is this life. Our consciousness of the vast wonder and beauty of the universe can never be paid for or earned. 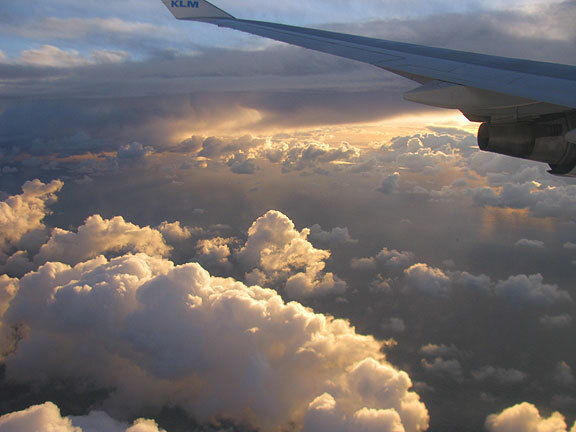 It is ultimately a humbling experience to be human. (In fact, the word humble actually is the same root as human, from humus, the earth). So the whole construct of earning and deserving this life is absurd. As well as the judgment on others that they need to get a “job” and that they would then deserve to participation life.